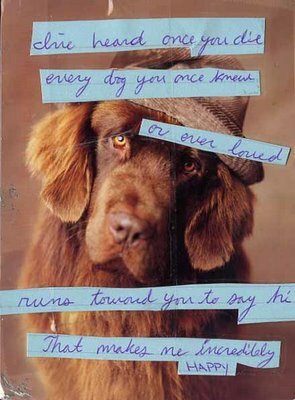 I saw this on PostSecret recently. It's a nice thought, isn't it? When we take our own puppy to our local doggie playground, we always like how all the dogs immediately stop what they're doing and run over to the gate with tails wagging every time a newcomer arrives. So who knows? Perhaps it's true. On a related note, remember that old Twilight Zone episode? Don't be tricked.